Last month I shared my first attempts at making LUSH-style jelly soaps at home. My kids loved those soaps so much that I decided to make a new batch this month. Instead of reusing the heart mold, I thought I would make some Easter egg jelly soaps. 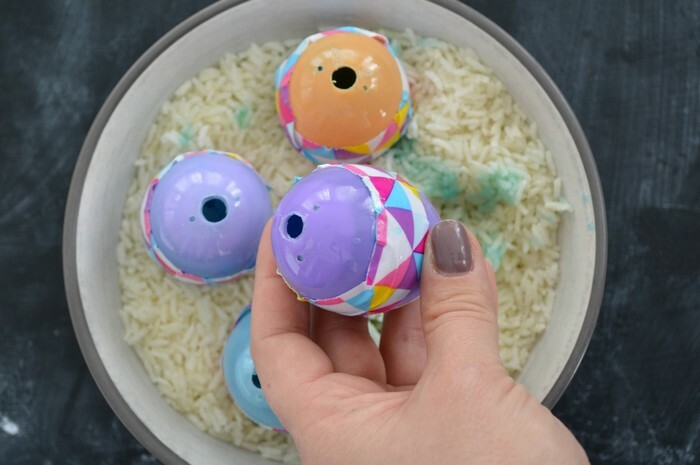 I repurposed some old plastic eggs for this fun project! If you have kids, you probably have a few of these lying around your house somewhere. If not, you can buy a dozen for about 88 cents at Walmart or Target. 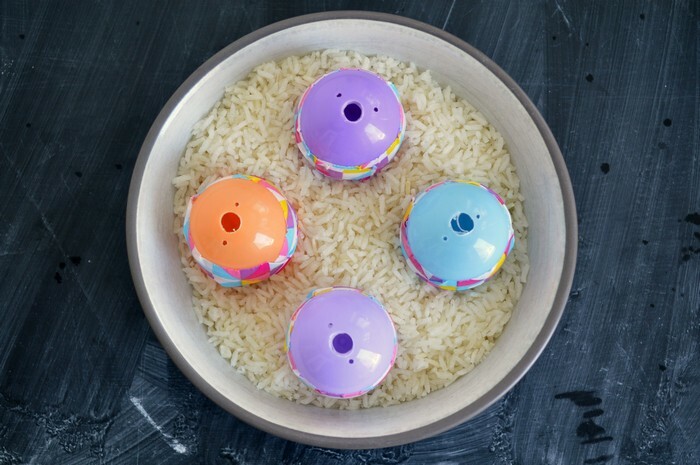 Before you can get to work on the soap making, you have to prep your egg molds. 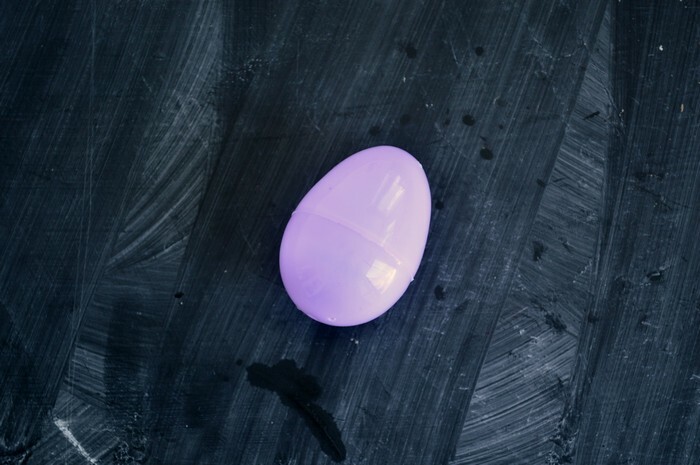 Use waterproof tape (like duct tape) to seal off any holes on the narrow end of the egg and the seam where the egg opens in the middle. 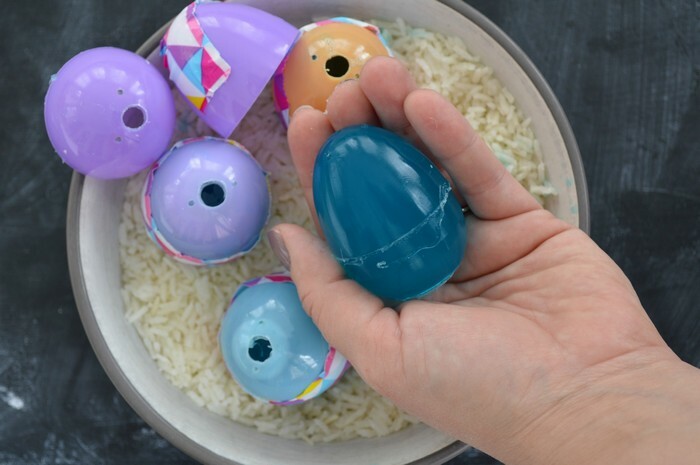 The use a drill, Dremel, or hammer and nail to create a hole at the center of the wide end of the egg. Then add some uncooked rick to a small bowl and nestle the eggs in, wide side up. 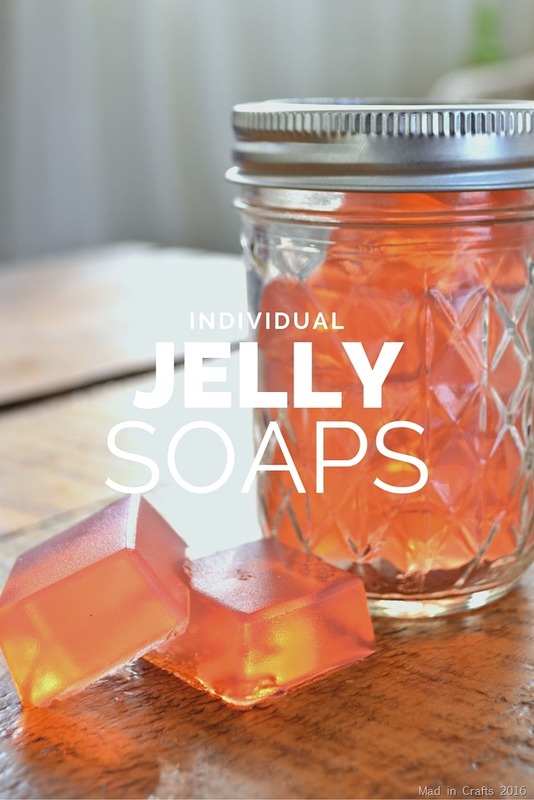 Mix up a batch of jelly soap and color it to your liking. 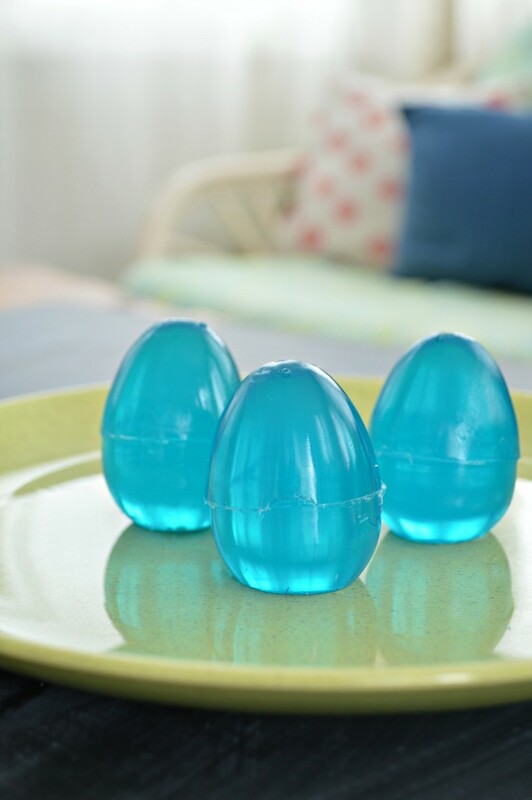 I used food coloring to make a pretty robin’s egg blue. 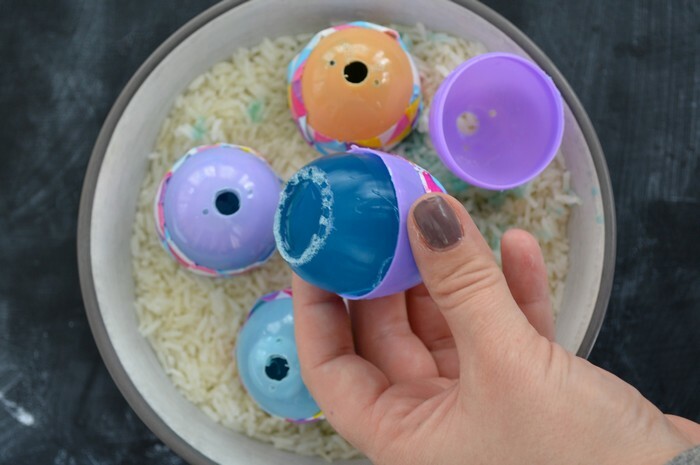 Carefully pour the soap mixture into the eggs. I used a frosting piping tip as a mini funnel to help me aim the soap into the molds. 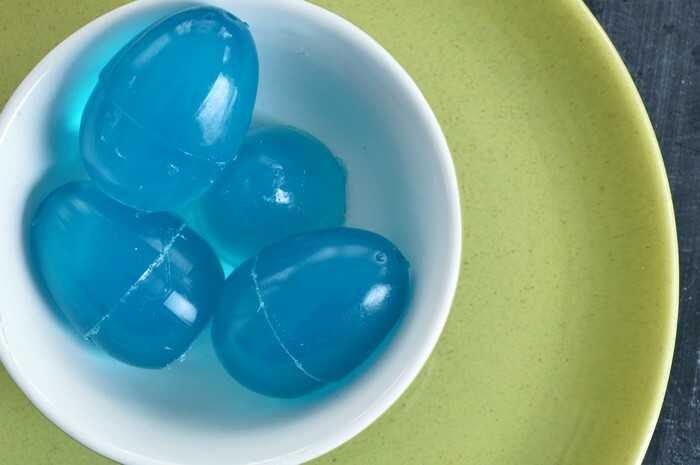 I was able to make 3 1/2 soap eggs with one batch of soap mixture. If I hadn’t spilled as much as I did, I might have gotten four whole eggs! Refrigerate the molds for at least 4 hours. 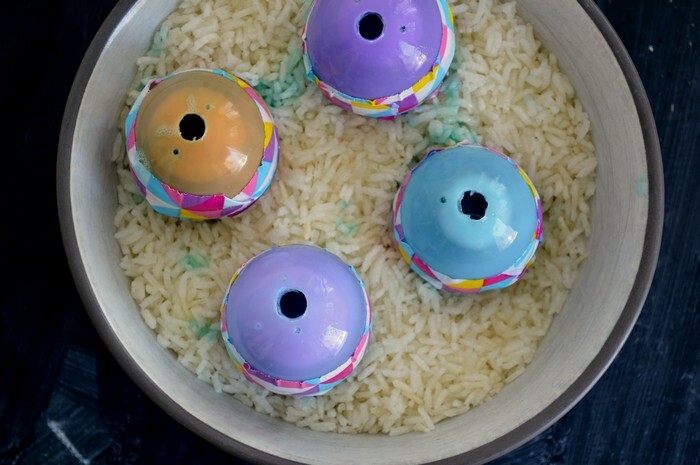 Remove the tape from the middle of the egg molds. 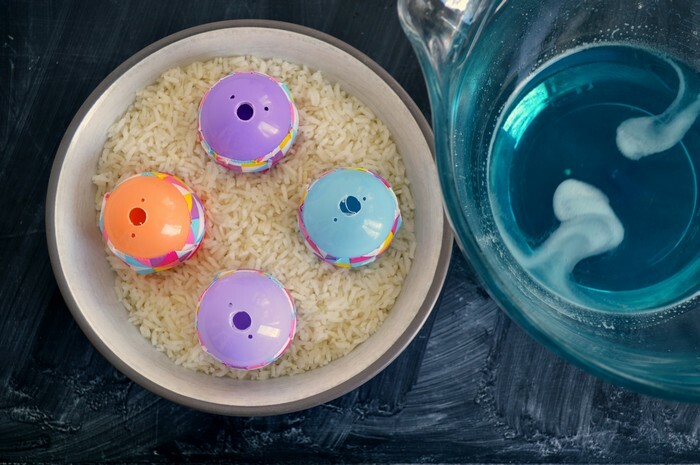 Carefully remove the plastic egg halves to reveal your Easter egg soaps! Wouldn’t these be fun in an Easter basket! 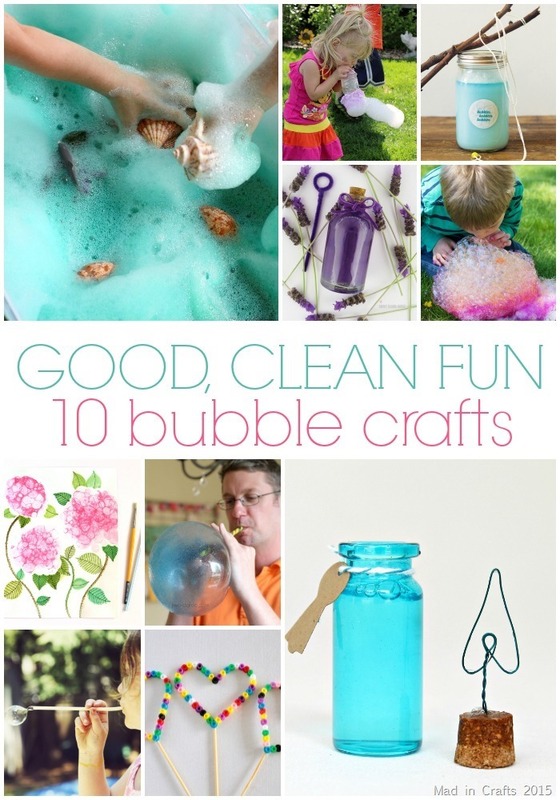 Remember to store the soaps in a mason jar to keep them fresh between uses. These are the supplies I used in this tutorial. These are all affiliate links, if you make a purchase (of anything on Amazon, not just these items) after clicking through, I will earn a small commission. Ads and affiliate links are the way I am able to keep this website running and to offer you free tutorials all year long. Thank you so much for supporting me and Mad in Crafts! I am not sure exactly how long they will keep, but they keep longer if you A) keep them in an airtight container and B) keep them in the fridge. Hope that helps!